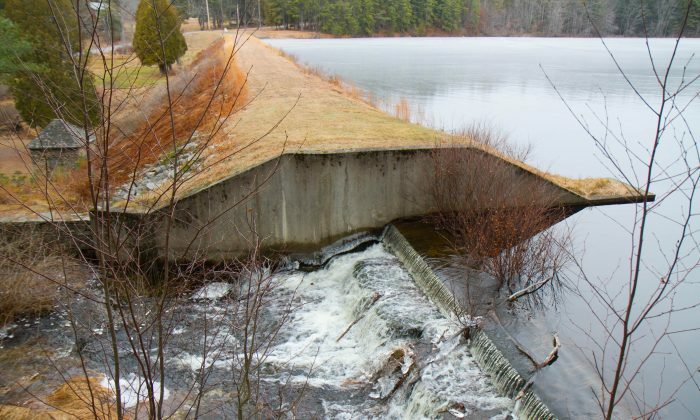 PORT JERVIS—Port Jervis’ watershed and reservoirs have been mostly hidden behind no trespassing signs, gates, and private roads for decades, keeping the roughly 2,000 acres north of the city in pristine condition. A few years ago, Mayor Kelly Decker and Recreation Director John Faggione started talking about opening up the land to hikers, bikers, and non-motorized vehicles. Just last year, a new trail system started taking shape in the watershed area and Faggione estimates about seven of the roughly 25 miles have already been cleared. “Our goal is to get people into Port Jervis and then from Port Jervis to hit the trails,” Faggione said. Some of the trails are access roads that already exist, but some will need to be made from scratch, which is where Dejay Birtch comes in. Birtch is a mountain biker who grew up in Port Jervis and now lives in Arizona. He said it has been a lifelong dream of his to see trails in the watershed, and was happy to offer his expertise in trail-making when approached. I knew it was a valuable resource for the community. “I knew it was a valuable resource for the community,” he said. Besides helping plan the trails, Birtch is planning an event on March 19-20 called SnowBall’s Chance Fat Bike Race that will be the grand opening of the trails. The event will be open to anyone, but will be geared towards mountain bikes with fat tires that can travel on snow. Not all the trails will be ready by March, Faggione acknowledged, and he didn’t know exactly when they would all be finished, but part of that is going to depend on labor. Right now both DPW workers and volunteers have been working on the trails and Faggione said he is looking for more volunteers to pitch in. The plan as it stands now is to have over 25 miles of trails connecting the city’s three reservoirs with two access points, one in Elks Brox Park and one by the southern-most reservoir, reservoir number one. The city is planning to install markers along the trails and put up bollards that will allow biking traffic and pedestrians to pass while blocking unauthorized vehicles. Unless the city decides otherwise, pets will be banned like they are in other city parks, Faggione said. The trails will not be plowed in the winter to allow for cross-country skiing, snowshoeing and other winter sports, but it will only be the trails that can be used for those sports, the rest of the property is off limits. The trails will not be plowed in the winter to allow for cross-country skiing, snowshoeing and other winter sports. Faggione said they are going to be vigilant about user-made trails, or “rogue trails” as he calls them, both because of their affect on the environment, and because the city’s property abuts a lot of private property in Deerpark. “We want to be very, very strict,” he said. There was concern that allowing people into the watershed area would bring with it problems like litter, dumping, and other adverse impacts. Faggione said the people he envisions using the trail are not the type of people who would litter or degrade the environment so he doesn’t see it being an issue. “We’re going to bring nature-loving people up here who are going to not only enjoy what we have in our backyard but also look after it, take care of it,” he said. Birtch said he thinks the cycling community would be those kind of people. “Ninety nine percent of the people who come out and do the trail maintenance and make sure the land is cared for are cyclists,” he said. Opening up the trails is part of the mayor’s larger vision to make Port Jervis a destination for outdoor recreation. The city is in the planning stages of building a white water park in the Delaware River, and the mayor is talking about a campground and adventure park in Elks Brox park that the trails would connect with. Birtch said he thinks the new trails will be an economic boost for the city, and listed places like Bend, Oregon; Copper Harbor, Michigan; and Downieville, California where this has happened. “We want to get them into Port Jervis so that they can visit Port Jervis, and hopefully shop in Port Jervis, spend money in Port Jervis, and then go utilize our trails,” Faggione said.